Currently I need to highlight certain sections in PDFs, or add annotations (comments/notes). These modifications would need to be saved. What tools are out there to do this on Ubuntu? To save the highliting/annotations directly in the PDF document, choose "File" -> "Save as..." and create a new PDF which will contain your edits. Edit: Inkscape supports PDF editing (one page at a time) and most people seem not to be aware of this so I'm adding it to the answer. Recently a new version of Foxit Reader is released for Linux. It has the highlighting and annotating support. It has more annotation options than Okular, including inline notes with transparent background, drawing of various shapes etc. Actually, none of these solutions work half as well as anything on Windows or Mac OS. Mendeley only supports yellow highlighting and importing pdfs into Inkscape or OpenOffice is pretty inconvenient if you want to read a paper and simply make some annotations. I really wish there was a working open source Linux alternative (xournal is good but too limited). But for the time being, I am happy with using wine. Here the launchpad bug of this missing feature from evince (poppler packaged for Maverick isn't enough updated). 21 april 2011 - Update Evince in Natty now support by default annotations (not highlighting). Evince in Natty is 2.32, poppler is 0.16.4. 08 March 2017 Update Evince in Ubuntu 16.04 supports highlighting. xournal is also some software which you use for this task. The evince package which is built-in in Ubuntu and is called Document Viewer can add annotations to PDFs. Evince 3.18.2 from the Ubuntu 16.04 default repositories has support for highlight annotations and moving annotation icons to a different position on the page. If you do not have a visible side pane on the left side of the opened document's window, click View -> Side Pane or press F9 to make the side pane visible. At the top of this side pane, there is a dropdown menu with options like Thumbnails, Index and Annotations (some of which may be dimmed for some documents). Select Annotations from the dropdown menu. You should now see List and Add tabs under the dropdown menu. In Ubuntu 16.04 and later, click the toolbar icon that looks like a notepad. A new toolbar will appear under the toolbar with two icons for adding text annotations and adding highlight annotations. Click on the icon to add an annotation. 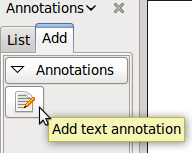 In Ubuntu 16.04 and later, the icon for adding a text annotation looks like piece of paper with a + in the upper right corner (marked by a diagonal yellow arrow in the below screenshot), and the icon for adding a highlight annotation looks like a piece of paper with three black blocks on it. Click on the spot in the document window you would like to add the annotation to, preferably a blank spot where the annotation will not cover anything else in the document. Your annotation window will open. Type your text into the annotation window. You can resize the note by clicking and holding the left mouse button on one of the bottom corners of the note, and moving it around. Close the note by clicking on the x in the top corner of the note. You might need to hover over the x with the mouse to make it visible. When you want to go an annotation click on the icon for it. If you can't see the annotation icons, then unfold the little black arrows to the left of the page numbers in the side pane to show them. The text annotation icon looks like a piece of paper with a pencil over it in Ubuntu 14.04 and it looks like a pencil in Ubuntu 16.04. The highlight annotation icon looks like a piece of paper in Ubuntu 16.04. When you close the document you will be asked if you want to save the changes you made to it. In Evince 3.31 and later the keyboard shortcut for adding a text annotation will be s and the keyboard shortcut for adding a highlight annotation will be Ctrl+H. There is a package called pdfedit that can do this. Mendeley Desktop is an excellent reference managers and it works flawlessly in most Ubuntu versions. It is ideal for papers and academic writing and supports notes and highlights synchronization. Evince (or Document Viewer), the default pdf viewer as of Ubuntu 18.04 also supports highlighting and annotations. To show the annotations menu bar, you must click on the red circle (see below). The annotation options appear and you can annotate or highlight as seen in the blue circle in the image below. For me the best solution was PDF X-Change Viewer. The only issue is that sometimes when you scroll fast it shows some white spaces over the text, that clear when you click or select a line in the document. There is an option in the Edit menu under Preferences\Performance\Threads Usage: "Use synchronous mode of page rendering" which prevents those white spaces in mine. The PDF viewer in Mendeley allows you to highlight and annotate PDFs. To save the modifications you need to File > Export PDF with Annotations. However Mendeley is not open-source, and it forces you to use an account... But otherwise the functionality is excellent. It seems Okular has to be built with Poppler at least version 0.20. It works with Ubuntu 13.04. There's a plugin for OpenOffice.org that does this. 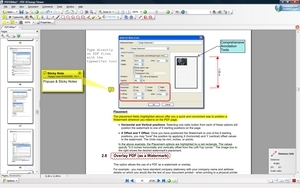 Master PDF Editor is a good software for annotating PDFs. There is a free version for non-commercial use. In Master PDF Editor you can save PDF in a normal way without the need to saving PDF using "save as". In okular as far as I know you can't add or edit bookmarks but in Master PDF Editor you can easily do that. In okular you can't add images to pdf, But in Master PDF Editor you can. It uses too much RAM. I have got a workaround to this problem, but it is too localized. Using okular for reading a pdf file and then annotate by pressing F6 to bring Highlighting toolbar. After annotating, you can save the file as document archive, which preserve the annotation. From File -> Export as -> Document Archive. Note This file can only be opened by Okular. I was searching for exactly the same. For me, qpdfview works like a charm, is simple to use and lightweight. Its annotations and text highlighting is recognised in Adobe Reader (Linux version 9, Windows. iOS). Editing done on the aforementioned platforms are recognised by qpdfview as well. It allows you to delete annotations and highlighting too, and stores annotations in the PDF. I've tested PDF X-Change viewer and I experienced the same white space problem while scrolling. I'm currently using Foxit Reader 4.3 which works really flawlessly. Foxit 5 crashes with wine 1.3 but works fine with wine 1.4 and 1.5. The only minor bug is that when you add a text annotation, it will ask you if you want to download the dictionary. You simple click cancel and keep working. It will keep asking you just once every time you open Foxit. I managed to make Foxit reader 4 my default pdf viewer but can open files by double clicking a pdf file only if Foxit is not open. With Foxit 5 this issue is solved too. See this thread: How do I set a wine program (ex. Foxit Reader for Windows) as the default program? Hope the pdf annotation feature in evince improves to avoid using wine. Please note that you have to first remove the old version of Evince before you install the new one. Also, the program crashed few times on my first day of install but it is totally fine for a month now. I use an old version of Foxit Reader (the latest 4.x version from oldapps.com), and it works very well under Wine. At the moment, there is no good native highlighting solution! PDF Studio is, probably, the best solution. It is not free, but you can install it using the Ubuntu Software Center. I think that Xournal is the tool you're looking for. What you should do is exporting in PDF, and the changes will be saved in pdf. And okular save the hightlighting separetly then if you want to save the hightlighting you have to save the pdf like new file to save the hightlighting. I had the same question but unfortunately I didn't arrive to any satisfactory answer, being okular the closest one (but as you say, it does not save the changes in the same file, which is a problem). I finally decided to use "PDF-Xchange Viewer": that piece of program makes exactly what I wanted to do and does it well, but it has two problems: it is free but not opensource and there's no linux version, although it can be used in ubuntu via wine. I wish there were better ways to annotate PDFs and so on. Maybe you could open an issue at okular developers so hopefully they can implement that feature in the nearly future. LibreOffice Draw works reasonably well for PDFs. It can not only annotate but do all the features of Draw such as drawing lines, shapes, etc. It saves as its own file format .odg but can export as PDF. You should also try PDF Buddy, an online PDF editor that supports highlighting, annotation, and other common editing features. It's a fast and easy solution that works in any modern browser. I got good results when annotating and editing PDFs online using PDFescape. There's a limitation on file size (10MB) and number of pages (100) though. Not the answer you're looking for? Browse other questions tagged software-recommendation pdf annotation or ask your own question. What I can use to highlight PDF? How can I highlight paragraphs in emails and add private notes to them? How can I add text and images (for example, a signature) to a PDF? How can I annotate PDFs so notes are compatible with Adobe Reader for Win/OSX? What Software to Use for Tagging/Annotating/Commenting/Highlighting Video Footage? How can I configure Okular to save annotations in the pdf file by default?